Ahh! December! We are officially a mere 24 days from my favorite day of the year. Cannot wait. One of my favorite traditions that Corey and I have for this time of year is our activity advent calendar – we did it last year and it was so. much. fun. We absolutely loved having fun Christmas-y things to do every day leading up to Christmas, and it was something that we looked forward to every day. So, of course, when this year rolled around we couldn’t wait to try it out again. This year, we decided to expand it a bit and have an activity every day in December, rather than just the last few days – we wanted to extend the fun, and our Christmas breaks don’t start until right before Christmas this year, so it’s pointless to wait like we did last year. This was a seriously easy project to throw together – I just created a Word document with all of our Christmas activities, printed ’em out, and tossed them in some homemade envelopes. 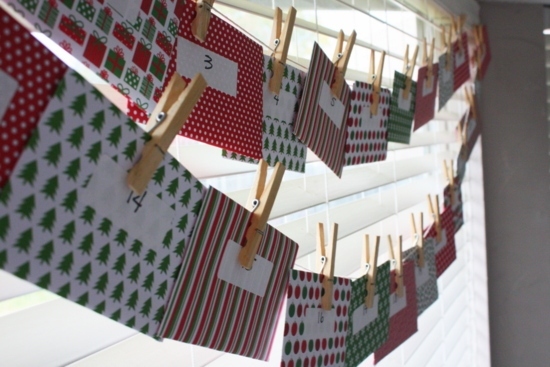 Add some twine and clothespins and we’ve got a super cute activity advent calendar! 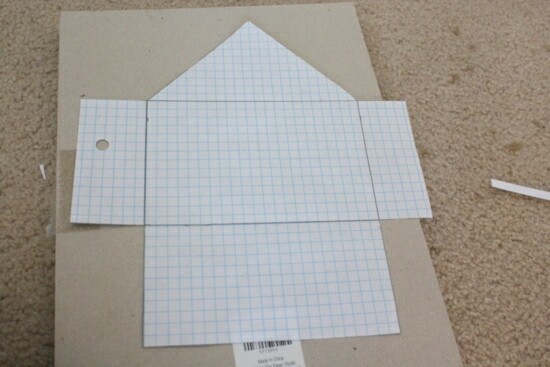 To make the envelopes, I just grabbed a pack of cute Christmas paper from Hobby Lobby, had Corey create a template for me that would fit my cards, and then cut and folded them. It took maybe an hour to put all of the envelopes together, and it required zero concentration so I was able to do it while we watched X Factor one night. Once I had all of my envelopes folded, I just printed out some labels for the numbers, threw in the cards, and hung them up. I love how it looks and I can’t wait to take the first one down today and get started on the fun! 25. Christmas day: Make a special breakfast! I’m pretty thrilled about it, and I can’t wait to get started! We’ll be doing weekly round-ups of the activities as we do them, and I’ll post about it every Thursday, so be sure to check back. And even more exciting, if you want to make your own advent calendar, you can download our cards by clicking here. Obviously, ours are a bit personalized, but I included a few blank ones in case you want to write your own in. Enjoy! 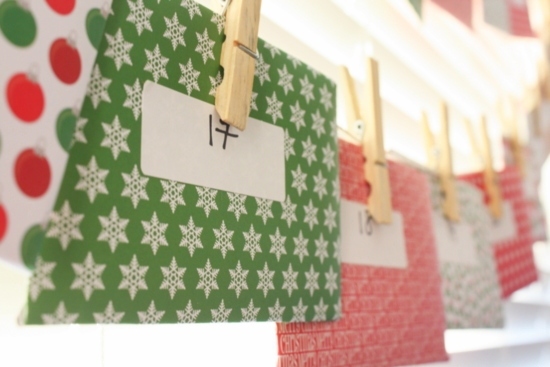 Do you do any sort of special advent calendar? 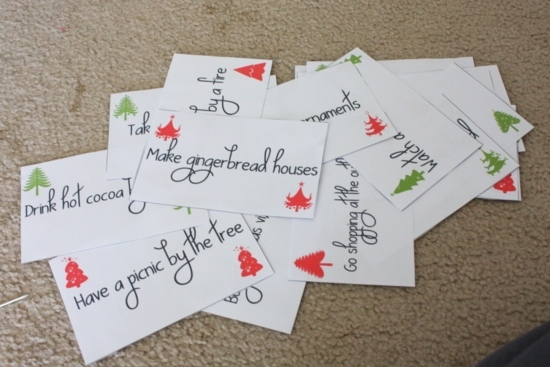 What are some of the things you like to do around Christmas time? What a cute idea! I really like this. You know, I’m having a linky party right now for holiday family friendly activities, and I would love iti f you would link this project up!! I hope you well. This sounds like such a fun December tradition! This looks like so much fun! 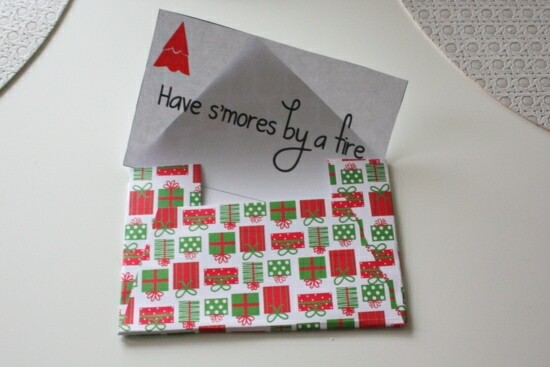 I want to borrow this idea next year, I love it! Our big tradition is cutting down our tree. 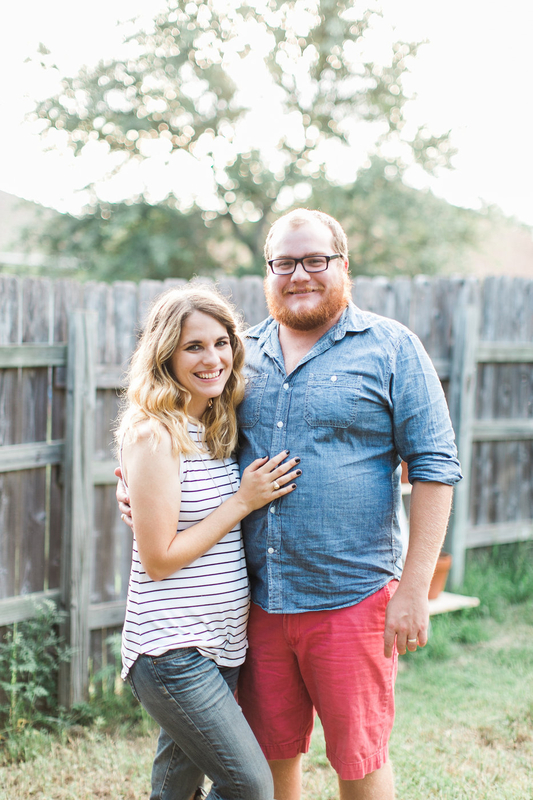 We did it for the first time the year we got married. We go and take tons if cheesy pictures. It’s a lot of fun. LOVE this! You always have the most creative ideas!